Wood window screens are an integral part of the historic character of many historic homes; however, due to disrepair or installation of replacement windows, it is a detail often missing. Installing wood window screens on historic homes is generally a two-part project for a historic homeowner: first the windows that have been painted shut need to be made operable, then the screens have to be made (or repaired) and installed. Releasing a stuck window is not rocket science, but it generally requires some muscle and patience. A web search for “windows painted shut” brings up countless websites with step-by-step instructions for loosening stuck windows, including HGTV and This Old House (they offer a video). Professional help can be called in if you are not particularly handy or have windows needing more extensive work such as needing to reattach the counter weights (although this is also within most homeowners skill level once they get past the intimidation factor). Once the windows are made operable, repairing or building new screens is a simple carpentry project, but can be time consuming due to the quantity of windows on most historic homes. Window screens are usually simple wood frames (about 1-1/2 to 2″ wide) either the full height of the window or half height for some single-hung windows. For casement windows that open outward, screens can be made that install on the building interior. Screening options include fiberglass and aluminum in black, charcoal and silver finishes. Of these, unfinished aluminum most closely resembles the galvanized screen used historically, but provides less visibility than darker screen options. The screen is first attached to perimeter of the frame with staples, then a narrow trim piece, called screen mold, is nailed over the screen edge. Screen hardware consists of metal hangers that attach to the exterior window frame or casing and a hook and eye installed at the base of the screen on the building interior. Traditionally painted black, forest green, or another dark accent color, authentic window screens enhance the look of a historic house while improving function. I need wood frame screens for several windows in my 1922 Creaftsman. Do you service San Diego? Unfortunately, we are not currently offering shipping for any of our products right now. You may want to check Coppa Woodworking as I believe they offer real wood screens. Keep up the good work! Your community is lucky to have someone other than just new window salesmen available. So many perfectly fine windows end up in the landfill due to lack of craftspeople. How are exterior wooden screen typically attached? In your picture, I see the hanging clips at the top but don’t see how they’re secured at the bottom. I’ve found the basic turn button but they’re not very attractive. Any suggestions? When you use the top sash hangers as shown in the photos, a hook and eye is installed inside at the bottom of the screen to pull it tight. Many sash hanger kits come with the hook and eye in the package, but a few do not. For larger windows we like to install two hooks and eyes inside. Thanks for visiting our site. Hi, we have just purchased a Colonial Revival built in 1938. Nearly all of the sash windows are original. No storm windows. My immediate issue is that each and every window has an exterior fitted screen nailed in tightly with wood strips. To my eye they look to have been carefully fitted. I need to know the best way to remove them…the exterior windows are way overdue for cleaning. We can find no release mechanisms of any kind…just many tiny tiny nails. If you’d like to email a photo of your screens, I’d be glad to see if I can make any suggestions or pass along to some window restoration professionals I know for their input. 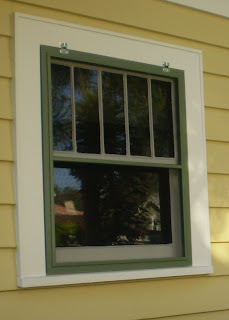 It will take a while but you can redo your historic windows on your own to save money. Window restoration is time consuming but not very material expensive. You may find that only some of your windows are in poor enough shape to warrant much work and others aren't too bad. There are many do-it-yourself videos/ guides out there. I live in Hampton Terrace,Seminole Heights. I have a 1900 bungalow with lots of windows, but have to say that Window Makeover came over and quoted, and way too expensive in this market, and economy.